Today, we are comparing the Nokia 5.1 Plus with the Nokia 6.1 Plus to see the difference between the two. 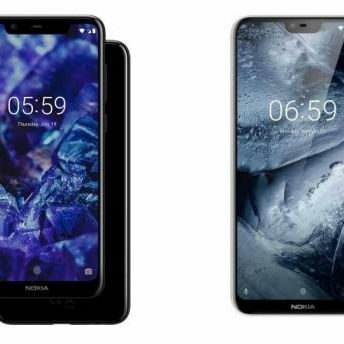 Earlier this year, the Nokia launched its first ever smartphone with a Notch on the top as the Nokia X6 in China, which is launched in India as the Nokia 6.1 Plus. The company has also introduced its younger sibling the Nokia 5.1 Plus in India alongside the Nokia 6.1 Plus. Both of these devices are a part of Google's Android One program. The Nokia 5.1 Plus is priced at Rs 10,999 India. on the other hand, the Nokia 6.1 Plus is available for Rs 15,999 on Flipkart. Let's start by discussing the display of these two smartphones. The Nokia 5.1 Plus offers a slightly bigger display than the Nokia 6.1 Plus as it has a 5.86-inch screen size, while on the other hand the Nokia 6.1 Plus sports a 5.80-inch Display. However, The Nokia 6.1 Plus offers a better resolution than the Nokia 5.1 Plus as it comes with an FHD+ display with a resolution of 2280 x 1080 pixels. Coming to the hardware, the Nokia 5.1 Plus is powered by a MediaTek Helio P60 processor, which is paired with a 3GB RAM and 32GB internal memory, while The Nokia 6.1 Plus comes with a Qualcomm Snapdragon 636 processor with 4GB RAM and 64GB internal memory. If you are not satisfied with the smartphone below 4GB RAM then the Nokia 6.1 Plus might be a better option for you. As far as the cameras are concerned, the Nokia 6.1 Plus offers a 16MP + 5MP dual sensor at the back with a 16MP on the front. The Nokia 5.1 Plus also have a 13MP + 5MP dual camera set up at the back with an 8MP unit on the front. The Nokia 5.1 Plus is available on Flipkart at Rs 10,999, while the Nokia 6.1 Plus is priced at Rs 15,999 in India. What\'s the best phone Nokia 8 or Nokia 7 plus ? Nokia 6 or Lenovo Zuk Z2 Plus or any other under 15k? One Plus One or One Plus X ? 8gb plus ssd vs 16 gb?